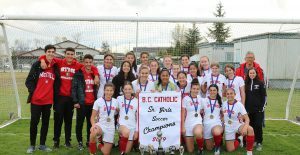 Congratulations to the Varsity Soccer team for taking home 1st place in the BC Catholics tournament! It came down to the wire but the Knights prevailed in penalty kicks. Sara Smyth and Sienna Mastromonaco were named as tournament all-stars, Cassia Di Girolamo the MVP, and Kaya Crescenzo received the Golden Boot for most goals scored throughout the tournament. Way to go Knights!